Mama has five girls: Ella, Henny, Sarah, Charlotte, and Gertie, and because there are no boys, they call themselves an “all-of-a-kind family.” The family doesn’t have very much money, but they still have lots to be happy about. The girls visit the library regularly, where they are always glad to see their friend, the library lady. They have a wonderful relationship with their father’s best friend, Charlie, who gives them treats when they are sick and often comes around for dinner on holidays. They even get a little bit of money now and then to spend on secret candy to eat in bed, and to buy gifts for their father’s birthday. Throughout the year, the girls keep busy and make the best of what they do have - wonderful friends, and each other. This first book in the All-of-a-Kind-Family series was written in the 1950s, but it takes place during the year 1912. Despite the age of the story and the fact that it is historical fiction, it is a fresh and accessible book, even today. Though the girls in the story are poor and living on the Lower East Side of Manhattan, they have many experiences that can be universally appreciated by children from all backgrounds, living in urban and rural environments. Each chapter consists of a particularly memorable episode in the family’s life, including things like the loss of a library book, the discovery of old books in their father’s warehouse, and missing out on the Passover seder because of scarlet fever. Readers learn not only what life was like for immigrants living in early 20th century New York, but also all about Jewish tradition and celebrations throughout the year. Though the girls in the story lived 100 years ago, they have many qualities, interests, and worries that contemporary kids undoubtedly share. The All-of-a-Kind Family is a great fictional representation of growing up in a Jewish family, as well as a sweet celebration of sisterhood. There are some surprise twists at the end of the book that bring together details and characters from earlier chapters, and I didn’t see any of those coming, so I was very pleased by that. I also like how quickly the story moves, and the upbeat tone that provides a sense of hope in difficult circumstances without becoming overly sentimental about city living or poverty. Readers who are anxiously awaiting another installment in the Penderwicks series might enjoy reading about the All-of-a-Kind Family - a series with six books in all - while they wait. 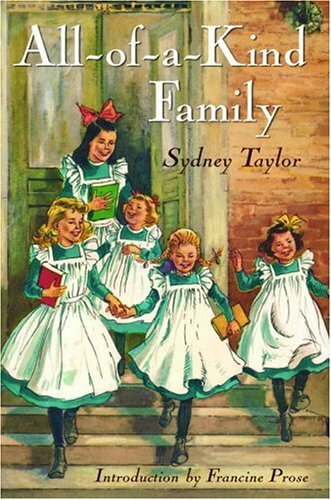 It might also appeal to fans of Megan McDonald’s Sisters Club books, and to readers who enjoy The Boxcar Children, The Bobbsey Twins, and Betsy-Tacy. I loved this book when I was a kid and I still remember parts of it fondly. After my daughters were born, I tracked down a copy and one of them now loves it too.